Della has got a massive crush on Dan, a boy she's known since primary school but has barely even managed to speak to since the day he offered her a pack of crayons because she was upset at her mum leaving her in school. So when she kisses him at a party, her world should be wonderful. 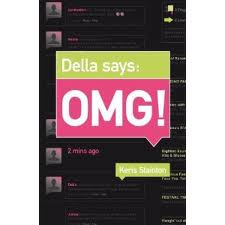 But quickly, things take a marked turn for the worse as Della loses her diary and someone starts spreading the contents around. Who can she trust, and will this ruin her relationship with Dan before it's properly started? I thought this was a really entertaining read. It features a strong central character in Della, a wonderful love interest in Dan, and a well-rounded supporting cast, of whom I particularly liked Della's ultra-laid back parents. It's also incredibly frank - I think it must be the first YA book I've ever read in which two characters have an open conversation about touching themselves. While it's a fairly light read, as the cover suggests, there's a bit more to it than I was expecting, and it raises some serious questions about trust, loyalty, relationships, and honesty, both with the disappearance of the diary and a sub-plot about Della's friend Maddy trying to choose between her long-term boyfriend and someone else she's interested in. I also thought the way that Della changed throughout the course of the novel, growing in confidence, was wonderful, and loved the way other characters helped her to see so many positives about herself. Oh, and I seem to be saying this about every book I review at the moment, both here and on the Bookbag, but it has excellent dialogue - Stainton captures the way teenagers talk perfectly. Parents of younger readers should probably take note; in addition to it being slightly more explicit than most YA novels there's some strong language here. I certainly wouldn't let that put you off picking this one up but you might want to bear it in mind. Recommended, especially for older teens. I think if you enjoyed this, you'll also like another great contemporary read, Don't Ask by Hilary Freeman.